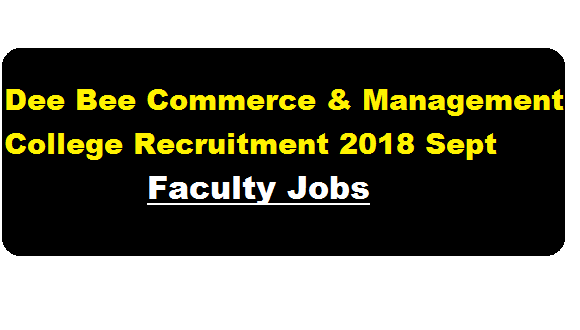 Dee Bee Commerce and Management College Recruitment 2018 Sept – Faculty Jobs : Dee Bee Commerce & Management College Guwahati has published a recruitment notification in the month of September 2018. According to the latest Dee Bee Commerce & Management College Recruitment 2018 September ,the college invites applications from eligible candidates for filling up the 02 nos of Faculty posts. In this section, we will mention details about the recruitment of Faculty Post under Dee Bee Commerce & Management College Recruitment 2018 Sept with vacancy details, eligibility criteria, salary with other details and requirement. Education Qualification: Candidates must passed MA in political science (preferably NET/SLET) / M.COM ( Preferably NET/SLET) Regular mode. Candidates are invited to physically visit the college office during office time with all their testimonial such as mark sheet and original certificate with two passport size photographs.